As soon as a patient has sufficently healed, the first prosthesis fitted, is a preparatory or temporary prosthesis. The temporary prosthesis is fabricated in a simple yet fully functional design. 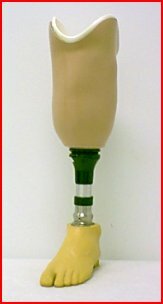 The below knee Temp prosthesis consist of a cushion insert, laminated socket, pylon, and a sach or dynamic response foot. Photo A shows a typical B/K temporary set-up. Suspension for the B/K temporary may vary from a cuff, cuff with a waist belt, or a knee sleeve. The temporary prosthesis has two primary functions. The first is to allow the patient to begin ambulating (walking) again. The second is to help control edma (swelling) and to start the maturing process of the residual limb. Once a patient has been successfully fit. The prosthesis is then finished by one of the thoroughly trained Rehab Indy staff. Photo B shows the completed B/K temporary prosthesis, which is now ready for delivery. Included with the prosthesis are various size prosthetic socks. One ply, three ply, and five ply socks are supplied to the patient so they may adjust their fit as their limb starts to mature. 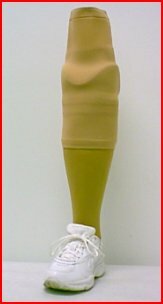 To learn more about prosthetic socks, click on: for more detailed information. After receiving the temporary prosthesis patients should continue to wrap or wear their shrinker sock when not wearing their prosthesis. This will prevent swelling and allow the patient easier donning of the prosthesis.